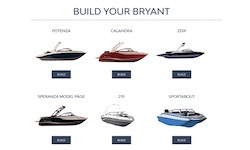 Sweetwater, TN (November 9, 2018) - Bryant Boat Company is excited to announce its new “Build Your Bryant” feature available now on its renovated website (www.bryantboats.com). This boat building update highlights the 2019 Bryant line with freedom to customize that is easy and user friendly. It includes nine models, new gelcoat colors, engine options, interior colors, and options for each model. Right now “Build Your Bryant” is live and available on all desktop and mobile devices.